PRODUCT: #136044, 7/8 in. 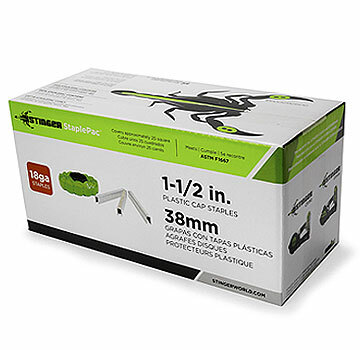 STINGER / CROSSFIRE STAPLEPAC. Contains 2000 1 inch OD Plastic Caps and 2000 7/8 length x 7/8 Crown 18 Gauge Staples. Price/Pack. DESCRIPTION: 20 times greater holding power than staples alone. Each pack contains 2000 1" diameter plastic caps and 2000 staples. These are the newly improved version with plastic tabs connecting the caps. Works with CS150. Does not fit CH38 or CS58. STAPLEPAC CONTAINS: 10 reels of 200 plastic caps each plus 20 clips of 100 staples each. National Nail Stinger CS150 Cap Stapler, with Case. Attaches 1-inch Diameter Plastic Caps using 7/16 Crown 18 Gauge Staples in lengths of 7/8, 1-1/4 and 1-1/2. For installing roofing felt/synthetic, foam board and housewrap. Price/Each.